Shemiras eiynayim? Kedushah? They are fantastic concepts – for tzaddikim. But for me? The first thing you should know is: You can do this. The second thing you should know is: You will be much, much happier. With hundreds of thousands of copies in print, The Chofetz Chaim: A Lesson a Day taught us how to make shemiras halashon an integral part of our lives. ,Now the Chofetz Chaim Heritage Foundation, which produced A Lesson a Day, shows us that shemiras eiynayim, even in today’s world – especially in today’s world – is both vital and doable. These daily readings pack a powerful punch. They’re short, illuminating, practical, often funny, and always right on target. What is kedushah and how do we acquire it? What is the single most effective way of avoiding temptations? What factors make it harder to “just say no” ? 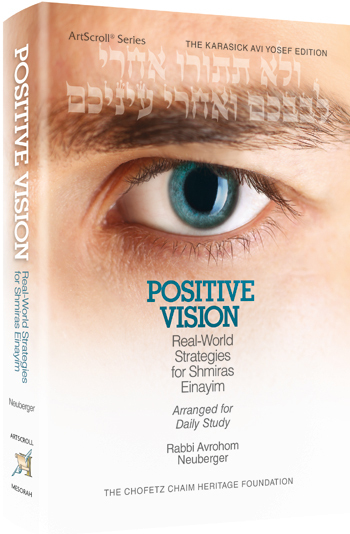 Positive Vision offers strategies and insights based solidly on Torah hashkafah combined with a deep understanding of the challenges we face in today’s world. In the past years Klal Yisrael learned that guarding our tongue leads to innumerable benefits in our personal and communal lives. Now, with the help of these daily readings, we’ll enrich every facet of our lives. And, yes, we’ll learn to tap into the kedushah that is the birthright of every Jew.